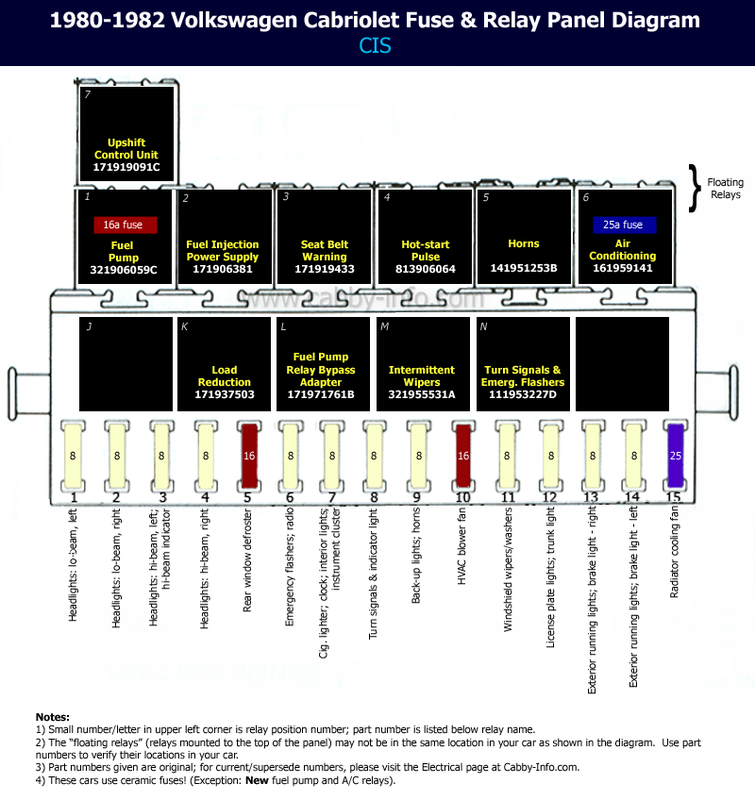 The Bentley Service Manual has numerous errors in its list for relays and fuses. Most of those errors have been corrected here! 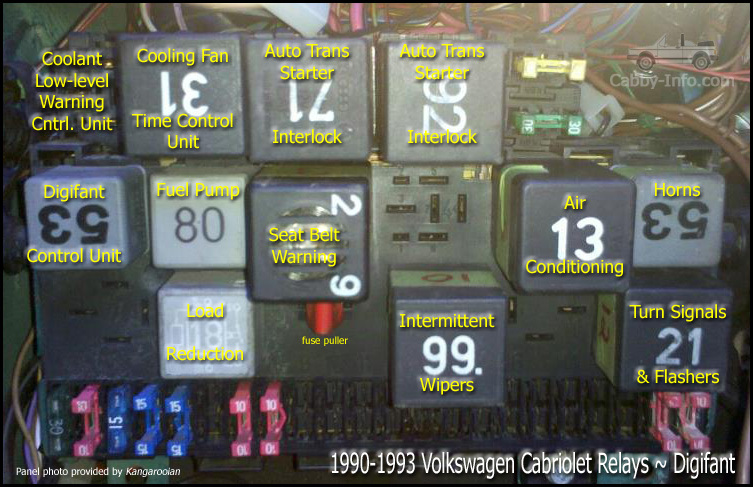 However, it's wise to verify your relays using the relay part numbers listed below, especially for the 1980-1982 cars. The fuse/relay panel is located under the dash, driver's side, behind the kneebar. 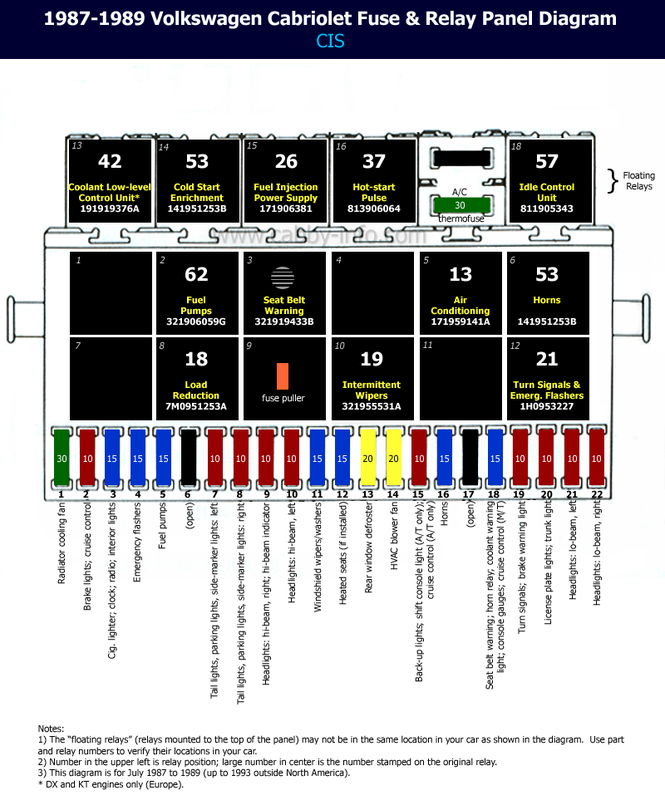 Fuse amperage: Green = 30; Yellow = 20; Blue = 15; Red = 10. 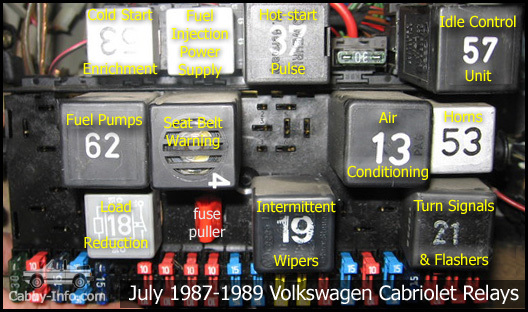 1980-1982 Cabriolets use ceramic fuses; their amperage is listed on the diagram. 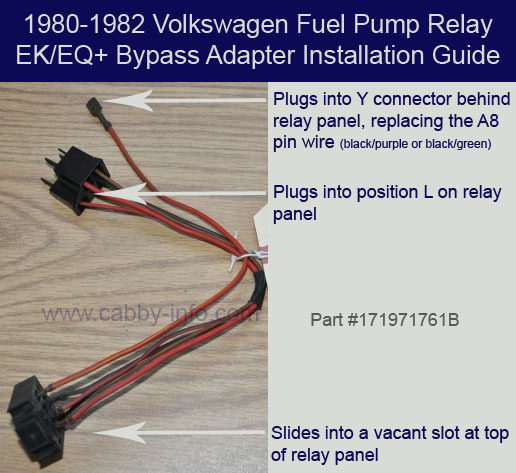 1980-1982 fuel pump relay: Originally installed in position L; due to a recall, the relay should have been moved to position 1 with a wiring loom bridge to position L.
If your car has factory-installed heated seats, the relays for this option are under each front seat. 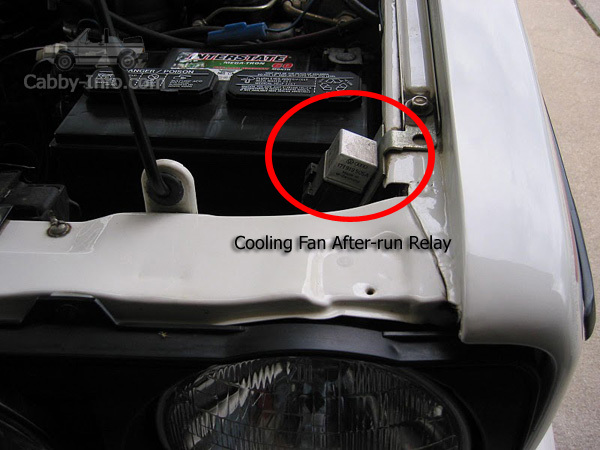 If your car has a factory-installed 2-stage after-run cooling fan system ('88+), the relay for this fan is mounted to the left front fender. If your car has factory-installed power windows, there is a control unit beneath the dash on the passenger side. 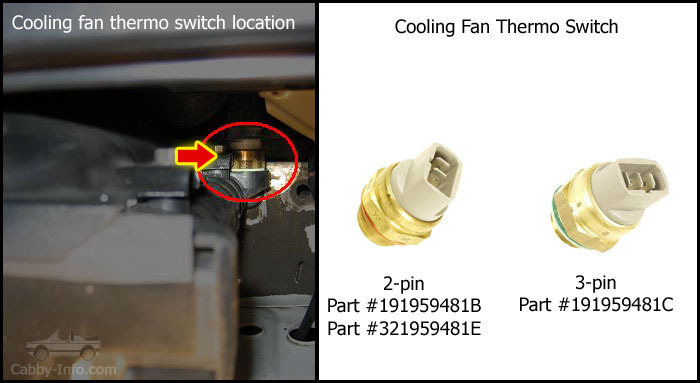 If your car has a factory-installed power top, there is a covered thermo-fuse above the relay panel. 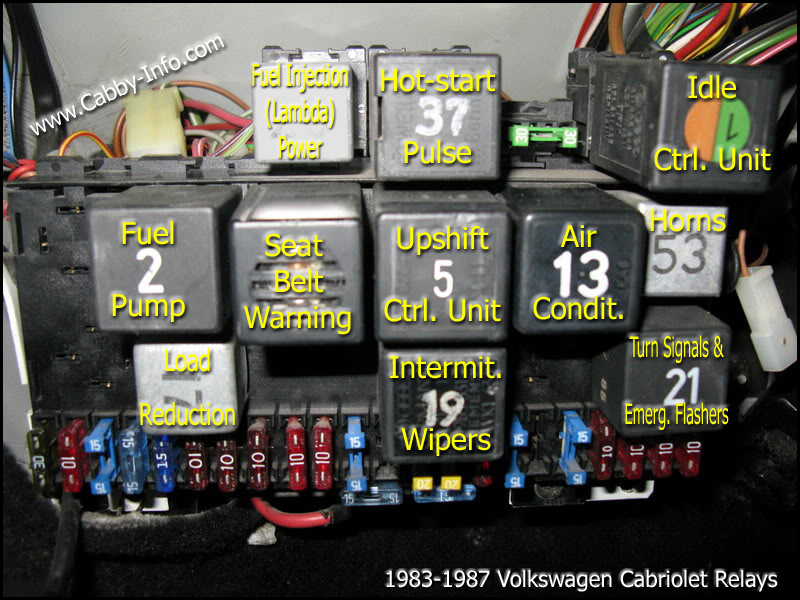 If your car has factory- or dealer-installed daytime running lights, there is most likely a relay attached to the top of the panel (not shown in the diagrams). Relay part numbers, both original and replacement (including aftermarket where available), are now in a PDF, which also contains relay pin diagrams. 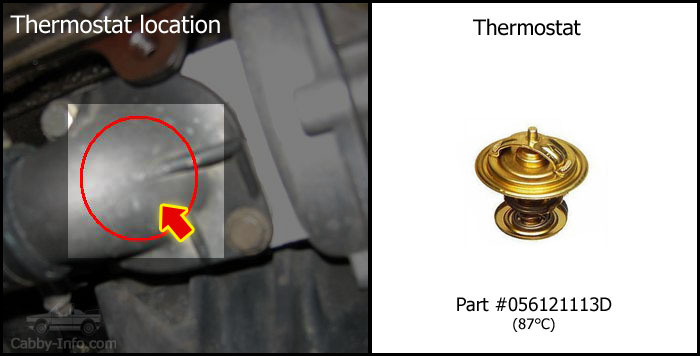 Click here for the relay part number guide. Warm-to-the-touch wires are not at all unusual in these cars, due, in part, to the way they were wired at the factory. However, wires that become so warm or hot that they melt their insulation and/or smoke are cause for concern. An overly warm wire is indicative of a circuit with high resistance. This high resistance can be caused by various issues: bad ground connections, poor wire connections, faulty switch, faulty relay, etc. 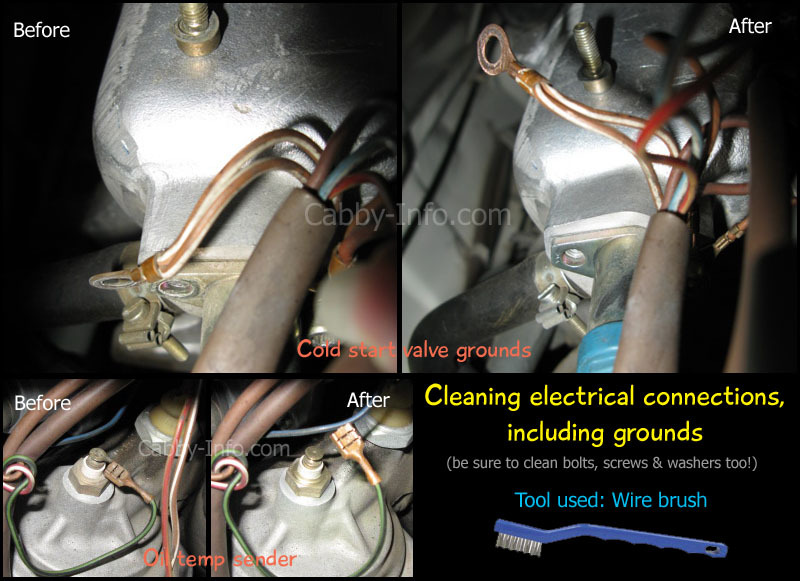 Wiring diagrams can be found in the Bentley Service Manual as well as the Haynes Repair Manual. 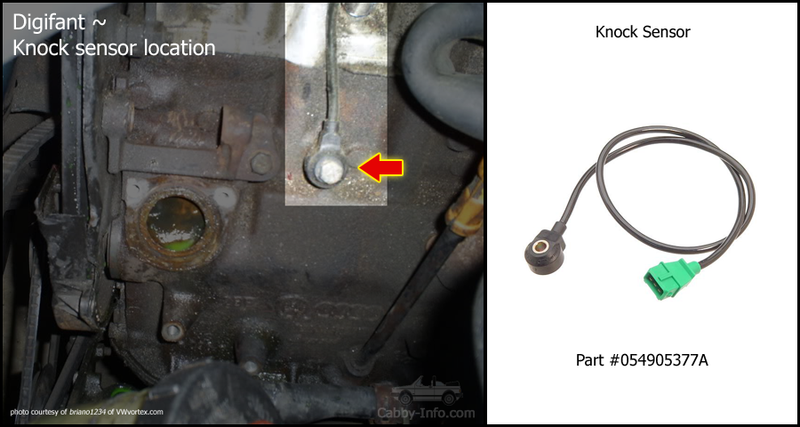 NOTE: Those with 1986 Cabriolets should follow both the 1986 and the 1987 Bentley main wiring diagrams; much, but not all, of the wiring in a 1986 resembles the 1987 diagrams and the latter diagrams are easier to read. 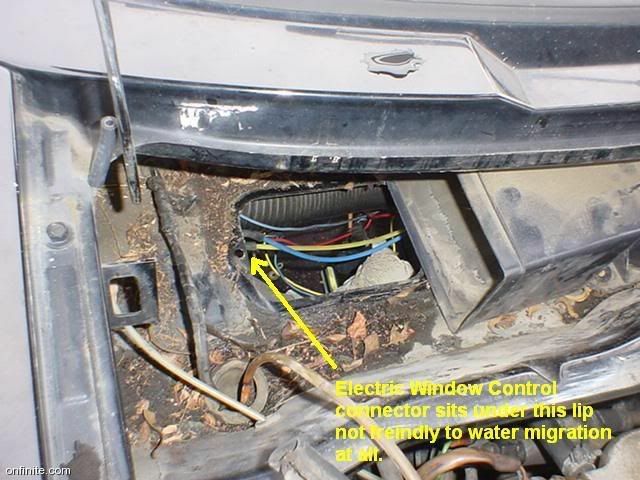 Voltage drop is a common malady on Cabriolets due to a poorly designed electrical system. Voltage drop can be witnessed on the VDO volt gauge with the engine running: When turning on the headlights, for instance, the volts will drop from 14 down to 12 (the drop is actually more severe when reading the voltage at the battery, then at the headlight; this is because the volt gauge is not 100% accurate); the volt gauge needle will also bounce in rhythm with the turn indicators. If the charging system is in good working order and all ground wires/connections are in good shape, this is nothing to really worry about. However, to combat voltage drop (and to increase headlight output), install headlight relays, clean all ground contacts and replace ground cables. Key-off battery voltage should be 12.6V with a surface charge; 12.3V without a surface charge. Charging voltage should be 12.8V - 14.7V. Under the shift boot, towards the front. 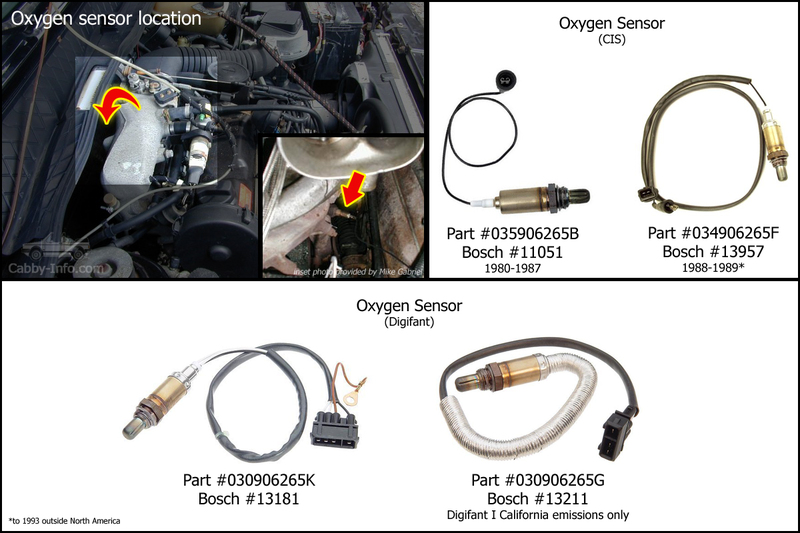 NOTE: Only Cabriolets equipped with Digifant I engines have the OBD I diagnostic port; furthermore, an OBD II diagnostic tool cannot be used to pull fault codes from an OBD I system unless it has an adapter! Check fuse #17, and the fuse in relay position 17. Fuses okay? Yes: Proceed to step 2. No: Replace blown fuse(s). Check for voltage at the power window control unit (located beneath the dash, passenger side; key to battery-on position). Is there voltage? Yes: Proceed to step 3. No: Remove the control unit and check for broken wires, broken internal connections, melted wires/connectors, water. If there is water intrusion: A) dry the control unit thoroughly; B) reseal the air plenum in the rain tray. If the control unit is still unresponsive or has melted wires, you'll need to buy a new/used one (part #191959875); and make sure the fuses are good and of proper amperage. Please refer to this thread and/or this thread and/or this thread on VWvortex for additional info. 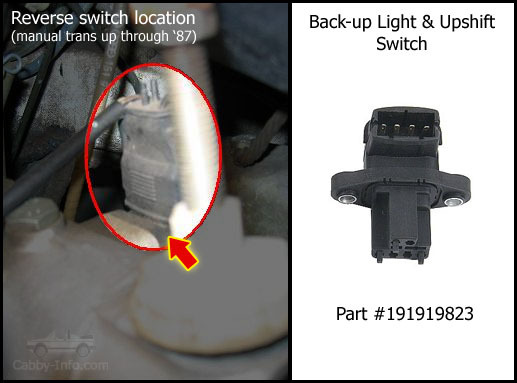 If the fuse/relay and bulbs are okay, replace the reverse (back-up) light switch located on top of the transmission (on automatics, the switch is connected to/near the shift lever). 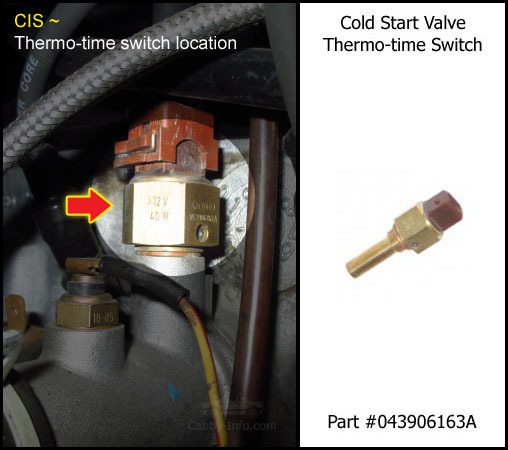 To test the reverse light switch: Disconnect the electrical plug, jump the black and black/blue wire terminals, turn the ignition switch to the battery-on position. If the lights turn on, the switch is faulty. Whether you are upgrading your headlights or not, it is a very wise idea to relay the headlights. The stock headlight wiring uses paltry 16 gauge wires, uses the headlight switch as a power source, and contains lengthy wire runs, all of which cause resistance and, ultimately, voltage drop at the headlights thereby reducing each lamp's luminosity. Adding relays powers the headlights directly from the battery/alternator, will reduce voltage drop in the electrical system, will extend the life of the alternator, headlight switch and ignition switch, will increase the light output giving you whiter & brighter light, and will reduce the chances of the headlight switch overheating. A standard Halogen sealed-beam headlamp produces 100% of its light output at 12.8 volts (or 13.2 volts in Europe) or above. Take a voltage reading at one of your headlights. What does your meter read? My meter read 10.86 volts at each lamp, lo-beam. Using voltage drop figures found on the Web, at 10.86 volts, each of those headlamps was producing less than 53% of their possible light output. After adding relays to the headlight circuit, each headlight's voltage jumped up to 13.36 volts, which means the lamps are now producing 100% of their possible light output. 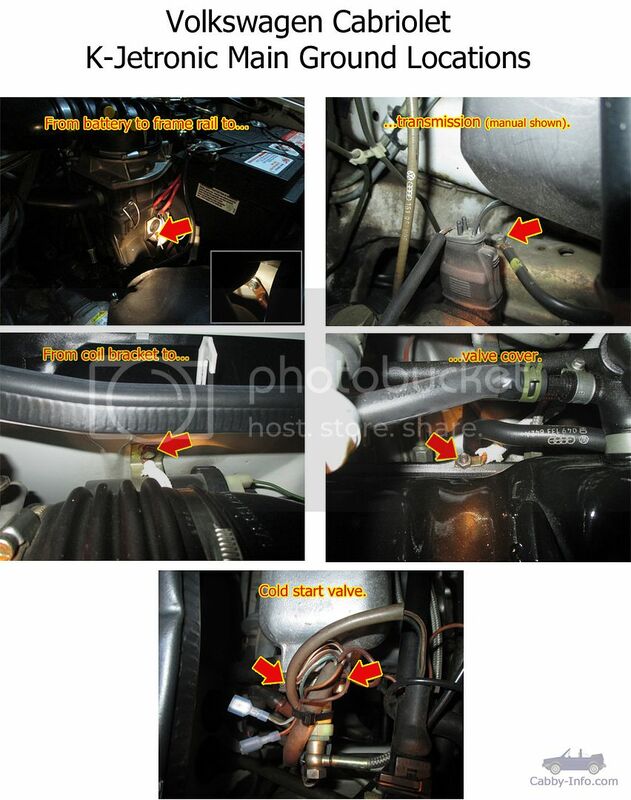 Further information regarding headlight wiring, voltage drop, adding relays, etc. can be found at Daniel Stern Lighting. If you are installing city lights on a North American Cabriolet, wire the lights to the stock wiring based on how you want the lights to be used. If you're installing Euro bumper lights that include city lights, you'll need to splice the two ground wires together prior to wiring them to the car's brown ground wires. Canadian Cabriolets built from 1990-1993 have hard-wired day-time running lights (DRLs) from the factory, as Canadian law requires DRLs. If, for whatever reason, you want/need to disable the factory DRL system:Pull the headlight switch and place electrical tape over the TFL pin; reinstall switch. If your switch does not have a wire going to the TFL pin, or is without a TFL pin: Your car may have hard-wired day-time running lights (DRLs) from the factory. To disable DRLs on these cars (thanks to Rob for the info): Locate the yellow 20-gauge wire on the back of the headlight switch; either push/pull it out of the harness connector, or cut it and cap/tape it off. You can also disconnect the same yellow 20-gauge wire from the A-21 pin on the back of the relay panel. Want to brighten up your lights, or change their color, or reduce the power drain? Replace the original incandescent bulbs with LEDs. LEDs have come a long way in the last several years. Rather than buying LEDs and the appropriate resistors, you can now buy LEDs that include resistors for a plug-and-play application in most instances. Download the DIY Guide for a how-to. Click here for a breakdown of what you need. Or, order a new one from an auto parts store. It is a plug and play swap; replace your existing relay with the new one. To program the variable feature: "Pull the lever into the intermittent position, and, as the wiper does it's sweep, click back into the stop position, if you want a 3 second gap, then wait 3 seconds, and click back into the intermittent position. Bam, you just programmed a 3 second timing." If ^that doesn't work: "Pull the stalk towards you to (for windshield washers) while the wipers are set to intermittent. This initiates the timer. If left alone at this point it will default to the 20s interval. Pull the stalk towards you again and it will set the timer to that interval, anywhere from 5 to 20 seconds." The dual-tone horns are mounted to a bracket, which is mounted to the front left frame rail. Click here for a photo. The CIS Cabriolets have a rev limiter built into the fuel pump relay. When the rpm reaches the built-in limit, the fuel pump relay shuts off the fuel pumps. This is a safety feature; however, the relay can be replaced with a "no-rev" or "hi-rev" version so that the cut-off point is eliminated or increased to approximately 7500 rpm. Digifant Cabriolets have a rev limiter built into the ECU and cannot be altered. 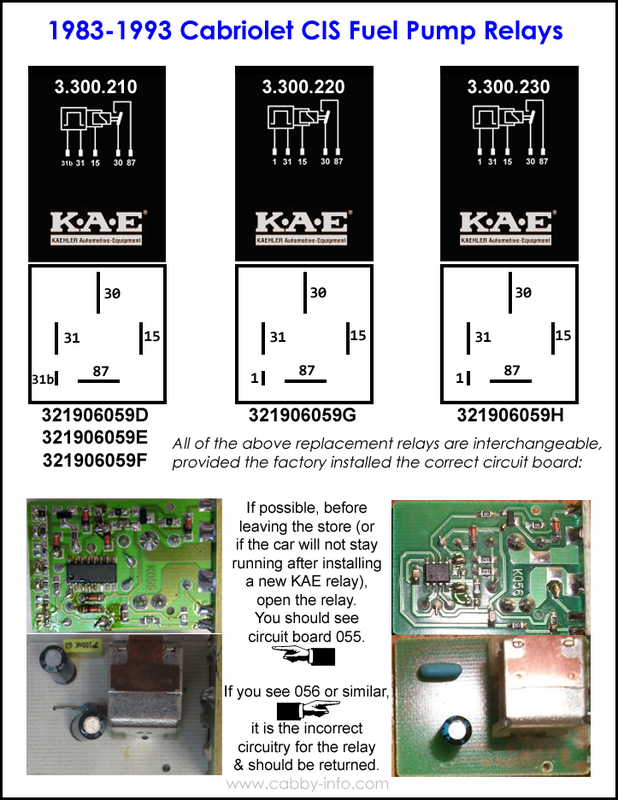 NOTE: A large batch of KAE relays were made with the wrong circuitry; if you have purchased these relays and the car is still having fuel issues, open the relay to check its circuitry). Click here for a visual. 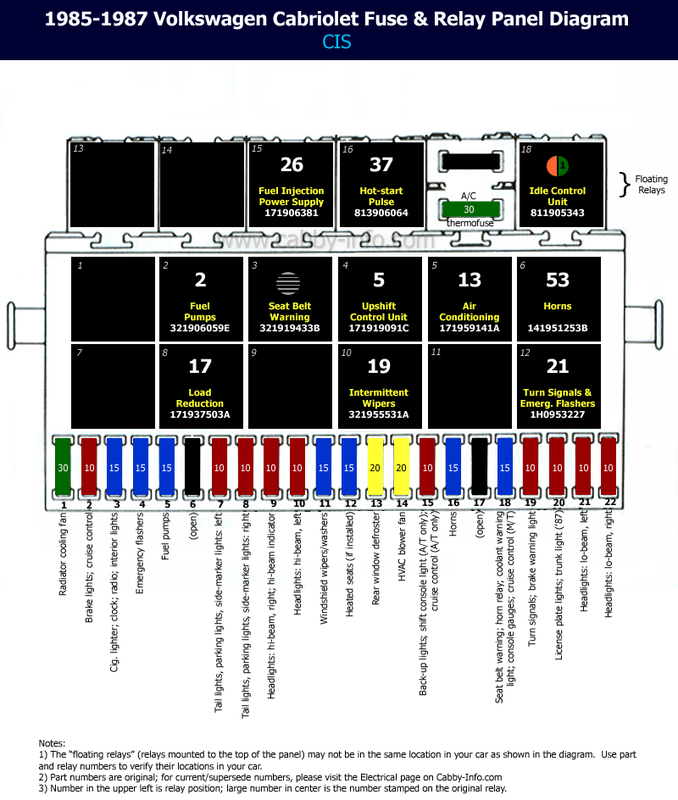 Click here for a manual supplement containing relay & fuse diagrams, relay panel pin-out schematics, and a guide to reading current flow wiring diagrams. * Up to 1993 outside North America. Please use the Bentley Service Manual wiring diagrams for complete wire routing for your particular car. Keep your electrical system tip-top by cleaning your electrical connections! K-Jetronic photos of main grounds. Digifant photos of main grounds. 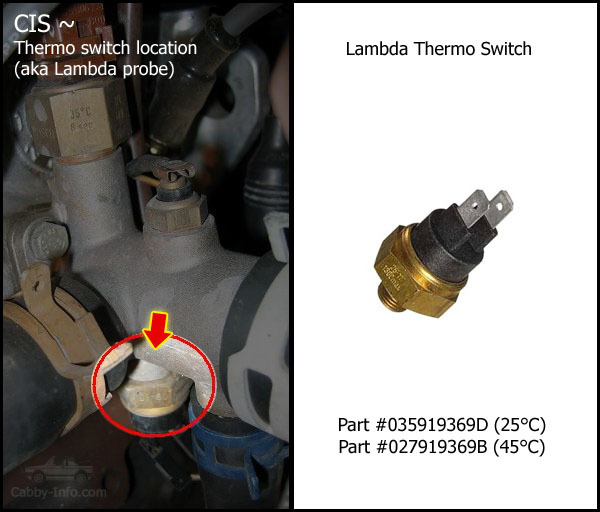 Note: Original switch is not replaceable; original assembly is NLA. 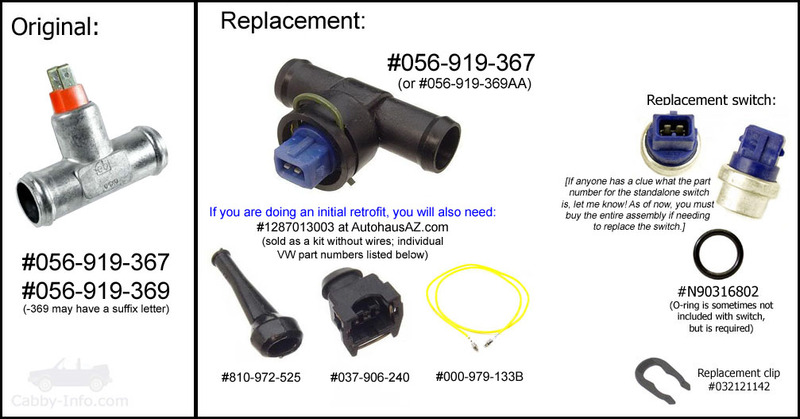 Click on image link at right for replacement details. Controls operation of 2-stage cooling fan after-run system based on engine bay temperature (CIS: 110°C; Digifant: 100°C). Note: Replacements may not be same color; just be sure that the temp rating is the same. 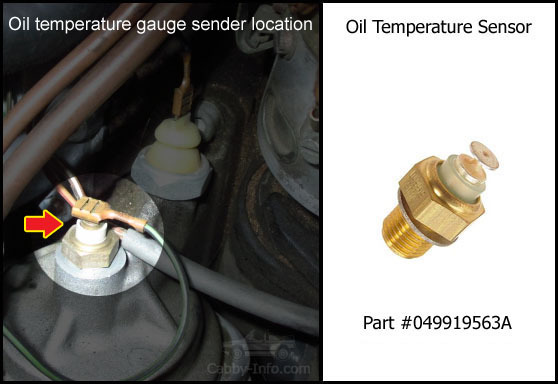 * Bentley Service Manual has this gauge's location listed incorrectly. Table is for reference only; please verify what your car has before ordering parts.